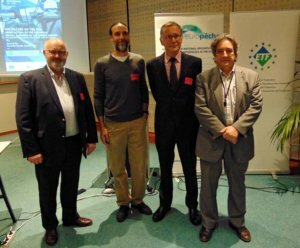 The European social partners for fisheries, Europêche and ETF, co-hosted a successful conference yesterday evening in the European Parliament with MEP Ricardo Serrão Santos. The event brought together a wide range of fisheries stakeholders, including representatives of the EU Institutions, industry and civil society with the aim to present and disseminate the results of the EU co-funded project PILLARS OF THE SEA: Joint action of the European Social Partners in the fishing sector. Safety and health at sea have always been a top priority for both partner organisations involved in the project. With this project our aim was to propose concrete improvements to the EU legal framework that could offer better health, working conditions and safety at sea for Europe’s fishers. Building on our years of close collaboration and cooperation, we pooled our knowledge and called on the professional expertise a legal expert in social affairs, a naval architect and the French Maritime Institute of Prevention. We were then able to put forward legal recommendations to really improve in fishers’ health and safety at work. Set out a clear set of common rules for the commercialisation and safe use of the deck machinery installed on board. The implementation of these recommendations would certainly help minimise potential threats to safety of life during fishing operations, increase comfort and also improve the attractiveness of the industry for young people in the EU. This project partially implements the work programme of the Sectoral Social Dialogue Committee for Sea Fishing in order to make significant progress in various key areas of interest for the social partners. Consequently, the European social partners have produced three different studies with the aim to contribute to better EU legislation regarding training, safety, accommodation, business efficiency and free movement of workers which will ultimately offer to our fishermen a healthier and safer working environment, better skills and competences. Pillar 1: Constitutes the aim to implement the STCW-F Convention in the EU through a Social Partners’ Agreement, as the lack of a common standard for the training and certification of fishers in the EU is a safety risk. See full report HERE. Pillar 2: Contains an analysis of the EU rule limiting increase in fishing capacity by imposing ceilings on gross tonnage and propulsion power. The outputs are a paper on the impact of the ceiling on working and living conditions and fishing vessel safety and productivity of the enterprises, as well as proposals and recommendations for possible solutions. See full report HERE. Pillar 3: Consists of a survey on the legislation in force in the EU regarding deck machinery. The results are recommendations for possible standardisation of the rules in terms of commercialisation, installation and safe use on board of fishing vessels. See full report HERE.